Rip off enough tin foil to fully cover each fish and place flat on the bench. Rip off some baking paper slightly smaller than the foil so it fits in the foil when wrapped. Place the fish in the middle of the paper. Season the inside with salt and pepper. Place the sliced shallots in the cavity along with the coriander roots. Rub the oyster sauce all over fish including the underside. Wrap the fish up, making sure there are no gaps in the foil. Allow some space so the parcel can fill up with steam when cooking. Allow to sit in the fridge for at least 30 minutes. Bake at 180 degrees Celsius or similar temperature in the Webber for abut 35 minutes. Meanwhile mix the aromatics in a bowl, spring onion, garlic, ginger and red chilli. Heat the peanut oil until it starts to smoke slightly or approximately 210 degrees Celsius. 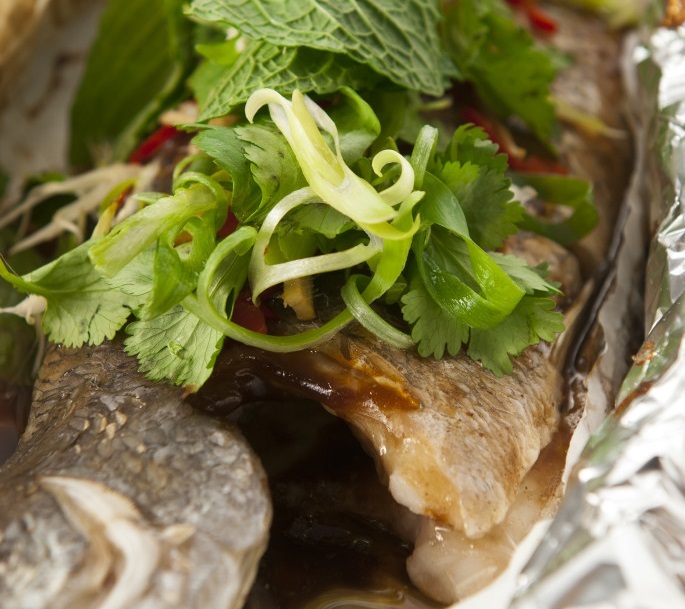 When the fish is ready, take out of the packet and onto a platter. Place the aromatics on top as even and as thin a layer as possible. Slowly spoon the hot oil on the aromatics until it starts to crackle and cook slightly and give off some nice aromas. Garnish with the picked coriander and mint and serve with steamed Jasmine rice.